The RoanokeSlant: USA: What’s Your Credit Score? 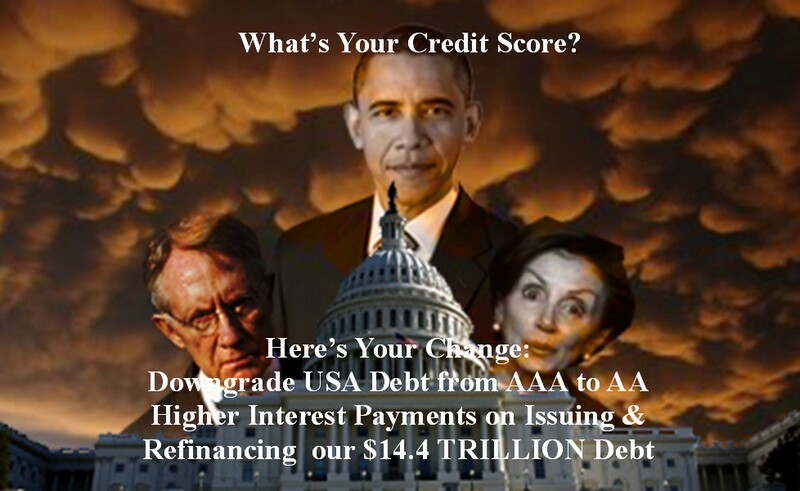 USA: What’s Your Credit Score? Credit rating agency Standard and Poor's on Friday downgraded the United States' credit rating for the first time in the history of the ratings. And it’s now clear that the “deal” will not be even close to $4 TRILLION in debt reduction and that will be the major driver of a downgrade in US Credit Ratings in the very near future. So much for all the liberal Credit Rating mis-disinformation! The Obama answer – we can tax our way out of this mess! Has any government in the history of the world ever taxed its way to prosperity?